Kulbhushan Jadhav Case: India's lawyers will present their arguments on Monday to the top UN court, which was set up after World War II to resolve international disputes. This will be followed by Pakistan's lawyers presenting their case on Tuesday. India will ask the United Nations's top court on Monday to order Pakistan to take Indian national Kulbhushan Jadhav, accused of espionage, off death row. Mr Jadhav, who India says was kidnapped from Iran, has been sentenced to death by a Pakistani military court. The Pakistani military court charged Kulbhushan Jadhav, 46, of alleged "espionage" and sentenced him to death in April 2017, following which India moved The Hague-based ICJ or International Court of Justice. 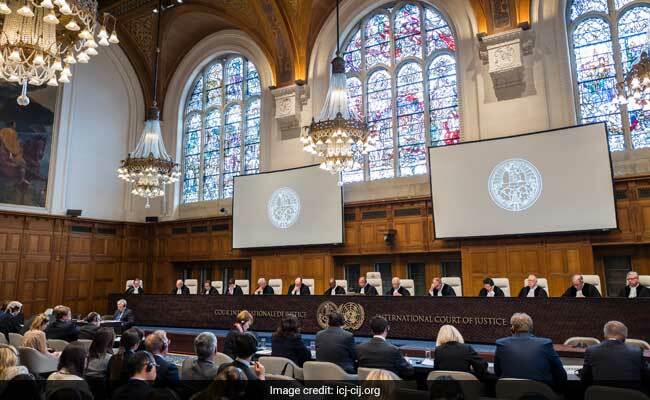 A 10-member bench of the ICJ had in May 2017, restrained Pakistan from executing Mr Jadhav till adjudication of the case. Pakistan claims its security forces arrested Mr Jadhav from Balochistan on March 3, 2016 after he allegedly "entered from Iran". India however, maintains that Mr Jadhav was kidnapped from Iran where he had business interests after retiring from the Indian Navy. India's lawyers will present their arguments on Monday to the top UN court, which was set up after World War II to resolve international disputes. This will be followed by Pakistan's lawyers presenting their case on Tuesday. India, in court documents, is asking that the International Court of Justice to order Islamabad to annul the death sentence given by what India describes as a "kangaroo court" in Pakistan. India has also highlighted how Islamabad has repeatedly violated the Vienna Convention by failing to provide him with consular access, as well as breaking the international human rights law. If Pakistan is unable to quash Kulbhushan Jadhav's death sentence, Islamabad should be found in violation of international law and treaties, and be told to "release the convicted Indian national forthwith", India has said. India slammed Pakistan in 2017 of harassing and mistreating Kulbhushan Jadhav's family during a visit by his mother and wife on "compassionate" grounds. India condemned Pakistan's actions by saying that the meeting was held in an "atmosphere of coercion". Islamabad reacted to the ICJ's urgent order to stay Kulbhushan Jadhav's execution at the time, but said it "has not changed the status" of Kulbhushan Jadhav's case "in any manner". The top UN court's decision will likely come months after this week's hearings. The case comes at a time when the already-strained ties between India and Pakistan took a further plunge following the terror attack in Jammu and Kashmir's Pulwama, carried out by Pakistan-based Jaish-e-Mohammed or JeM. Prime Minister Narendra Modi has warned that Pakistan would pay a "heavy price" after the Masood Azhar-led terror group Jaish-e-Mohammed claimed responsibility for the terror attack. More than 40 paramilitary troops were killed as explosives (RDX) packed in car ripped through a convoy bringing 2,500 soldiers back from leave. The terror attack happened less than 25 kilometres from Srinagar. The Ministry of External Affairs or MEA confirmed that the public hearing of Kulbhushan Jadhav will commence from Monday. However, MEA spokesperson Raveesh Kumar declined to go into the details of it. "The oral proceedings on the International Court of Justice are commencing on February 18. India will present its case before the court. Since the matter is sub judice, it is not appropriate for me to state our position in public. Whatever we have to do, we will do in the court," he said in response to a question.